Are you tired of bathing your dog only to get that wet dog smell that lingers forever? That’s why there are scented dog shampoos! We’ve put together our dog shampoo buying guide with a list of the shampoos that smell the best. Before we get into our products, let’s look at some of the things you’ll need to know when shopping for a scented dog shampoo. Know what you want so you can choose the best! Scent: This is why we’re here, isn’t it? You want a dog shampoo that smells great and will last so that you can eliminate the dog and wet dog smells from your pup’s coat. Choose a smell you like! 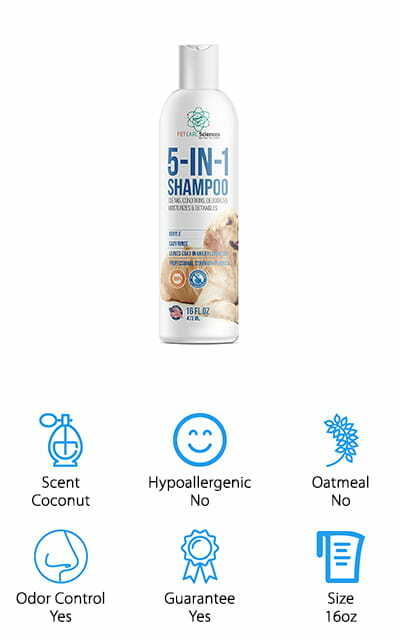 Hypoallergenic: This refers to whether or not the shampoo has basic allergens in it or something that might irritate or upset your dog’s skin or fur. Some dogs are very allergic to certain things, so look for a hypoallergenic shampoo! Oatmeal: Oatmeal is a soothing ingredient to help your dog’s coat stay silky and their skin stays moisturized! It’s widely recommended for dogs with skin issues like allergies or dry skin to help your pup feel comfortable and itch-free! Odor Control: You’re going to want a shampoo that completely takes care of your dog’s natural odor and keeps it away for longer than just a few days. Odor control shampoos do just that in addition to keep your dog clean. Guarantee: This is a guarantee that the company will refund your money if you or your dog isn’t satisfied with the product. In most cases, you only have to return the product to get a full refund! Size: This is how many ounces come in a single package of the shampoo. Bigger amounts of shampoo are going to be a better buy because you won’t have to repurchase the product as often, saving you money. Now that you know what you want and what to look for, we can show you our dog shampoo reviews. If you’re in a hurry, take a look at our top pick and budget pick first, as they’ll show you what’s available. But the rest of the shampoos on our list are definitely worth looking at too, and who knows? You might just find the perfect new wash for your furry companion. Let’s get to the products! The Pro Pet Works Dog Shampoo is one of the best dog shampoos for sale right now. It’s formulated specifically for dogs with sensitive skin. The active ingredients are almond oil and Aloe Vera to help pups that have skin problems – or allergies to certain foods, grass, or fleas. It is soap-free so it irritates their skin less, and you can even safely use it with flea treatments without worrying about them washing away! This shampoo smells like oatmeal and contains soothing oatmeal extracts to help keep your dog feeling and looking great! It smells great as well! Do you have ferrets or rabbits? It also works well for them! Pro Pet Works makes our list of contenders for the best dog shampoo for sale. Help your pup stay comfortable, soft, and smelling good with this amazing shampoo! It is hypoallergenic, so even the most allergic dogs probably will not have a reaction to it. Our pick for the best cheap dog shampoo is Fresh ‘n Clean. Instead of having a floral or herbal scent, this shampoo comes in a ‘fresh’ scent that will keep them smelling like they just got out of the bath for weeks to come! This shampoo will keep your pet’s coat manageable and free of mats and tangles due to the special formula. It’s even safe for cats! It isn’t concentrated, so it’s ready to use right out of the bottle. When you need to refresh your dog, wipe him down with a moist towel to instantly bring back the fresh scent! The great thing about this shampoo is that it leaves your dog smelling great for weeks, and it’s easy to refresh it without having to coerce skittish dogs back into the bathtub. It contains soothing aloe to help dogs with skin problems feel better while they look and smell great! We love this cheap dog shampoo! We think that Wahl’s Dog Shampoo is the best smelling shampoo for dogs out there right now. The Lavender and Chamomile combination beat out anything else we researched! It’s a four-in-one formula that allows you to clean your dog, detangle him, condition his coat and help moisturize his fur and his skin. It’s an easy-to-use formula that only requires one shampooing to get all of these benefits. It will leave your dog smooth and silky, as well as being clean! All of the ingredients in this formula are plant-derived, so it’s all natural and free of any harsh chemicals. It’s even free of the soap PEG-80, which is a fragrance and cleaning chemical. This shampoo is concentrated, so you only need a little bit of the best smelling dog shampoo that lasts! It’s even a calming formula so dogs with skin issues or allergies will be free of itching or irritation! We love that it conditions, detangles, and moisturizes! 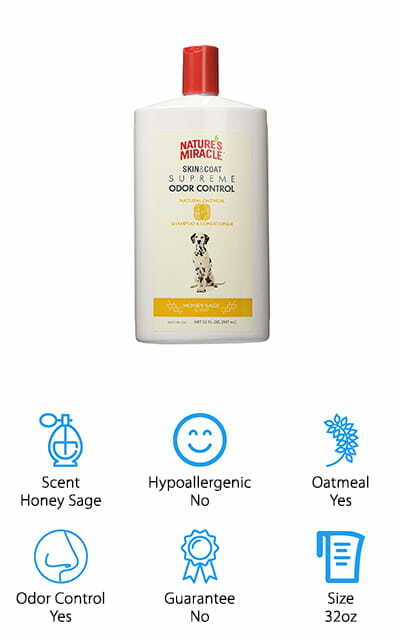 Our list of good-smelling dog shampoo wouldn’t be complete without Nature’s Miracle Oatmeal shampoo. It has odor neutralizers and deodorizers for pet odors that won’t seem to go away. It’s soap-free, so you don’t have to worry about it washing away any topical flea and tick treatments. It is made with natural cocoa as well as essential oils to help your pet’s skin feel great! It contains no dyes or parabens either and contains oatmeal to help keep skin hydrated and free of any itching. It’s a 4-in-1 formula that deodorizes, cleans, and conditions, as well as maintaining the natural oil in your dog’s skin. It’ll make their fur soft, reduce static, and give you a long-term clean! It’s the best dog shampoo for odor that we found in our research! Keep your dog soft, smelling good, and clean for the long haul with Nature’s Miracle! We love the oatmeal – good for you and your dog! PET CARE Sciences makes one of the best smelling dog shampoos we found! It’s made from coconut oil and palm oils, and has a light coconut smell that makes your dog smell sweet! It’s a professional quality dog shampoo, and it leaves their coat in great condition! It is a completely natural formula with no parabens, sulfates, or synthetic scents. It’s the best for your dog or even your puppy! The great thing about this shampoo is the 100% guarantee that if you or your furry friend isn’t happy with it, you can return it and get a complete refund. There is no risk associated with trying it out at all! You can make sure that it’s a product that you and your pup will love with no questions asked. If it is not, just return it! We love that the company stands behind its product so much that it offers this refund! Try it today with no risk! 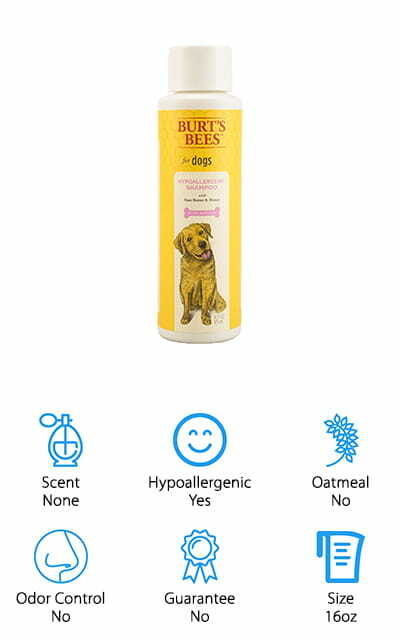 Burt’s Bees is known for making lip balms and other skin care products for humans, and now it makes a soothing oatmeal shampoo for dogs! It softens dry skin and conditions your dog’s fur, while soothing and cleaning at the same time. It’s made with shea butter as well as honey and, of course, the company’s signature beeswax. The formula is completely free of fragrances, sulfates, colors, and lathering chemicals that might be harmful or contain chemicals. 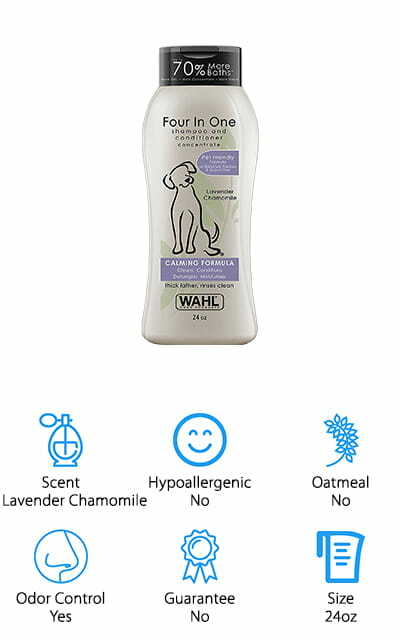 It works for dogs and puppies of any breed, and the shampoo is pH balanced so it doesn’t upset your dog’s natural oils. Even though it’s free of all chemicals, it still leaves your dog feeling fresh and eliminates the dog odor that many people don’t like. We love the soothing formula so that your dog’s skin and coat benefits from the use of this shampoo, and it comes in a 16-ounce size so that you won’t run out anytime soon! 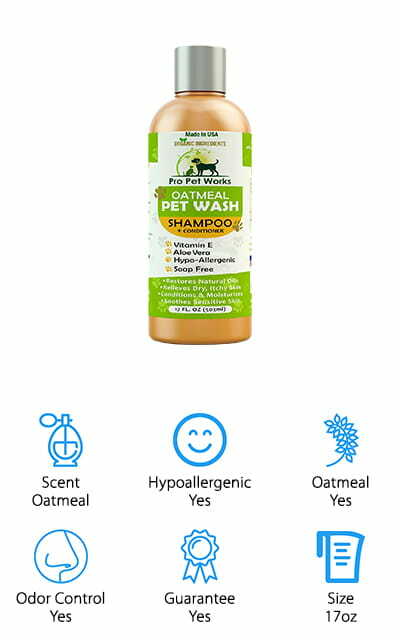 The Mika Pets Shampoo is soothing, with a formula that includes both real oatmeal and aloe to pamper your pup’s skin no matter what they’re allergic to! 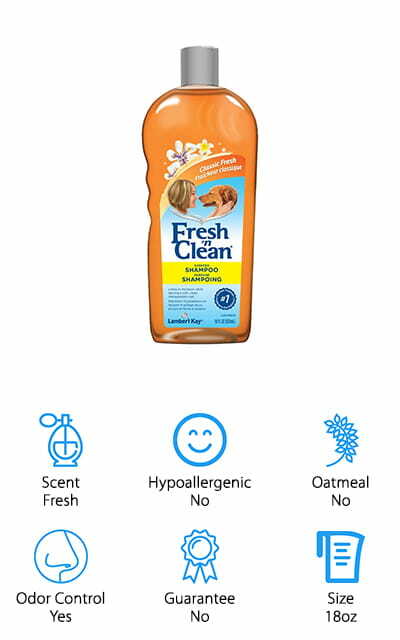 The concentrated shampoo cleans without irritating any allergy, making it safe for pups of all different types. It hydrates and conditions as well as moisturizing while still remaining allergen and sulfate free, so there are no harsh chemicals that will hurt your dog! It’s the best dog shampoo for pit bulls on our list because this shampoo is great for every breed of dog no matter how short or thick the fur! It’s also cruelty-free, so it isn’t tested on animals (in any harmful way, anyway). Get rid of your dog’s dry, itchy skin with Mika Pets’ Dog Shampoo, made with pure oatmeal and aloe to keep the itches away! We love that it works on any type of dog regardless of breed, allergy, or fur type. That’s versatile! So what’s the best shampoo for stinky dogs? Cloudstar Lavender and Mint! It’s a coconut-based shampoo that is free of alcohol and any other harsh chemicals, including soap! It’s a two-in-one shampoo and conditioner that works to both clean and moisturize and includes ingredients that soothe your dog’s dry skin and keeps their coat looking great. Even the best dog dry shampoo couldn’t leave your dog feeling this great! It’s made of cosmetic-grade ingredients and it’s good for frequent use no matter how old your pup is! We love the soothing bath time experience that this shampoo offers. 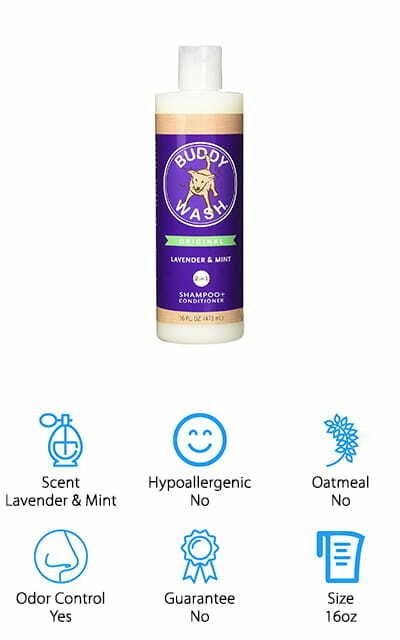 This Buddy Wash will leave your dog huggable and fresh. We are sure that both you and your canine companions are going to love it! The Lavender and Mint scent is great and will leave your dog smelling great for a long time. It’s a unique scent that you won’t find in any other dog shampoos! 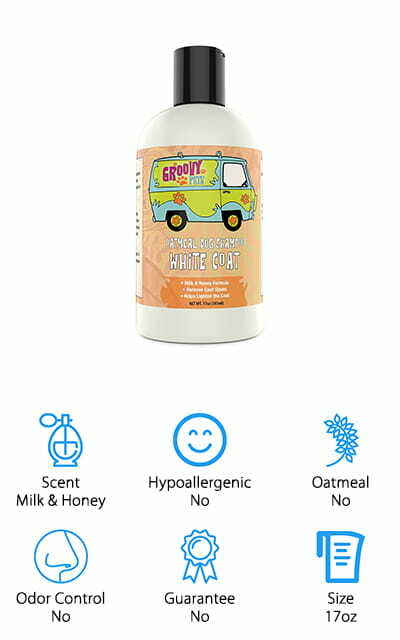 Groovy Pets’ Dog Shampoo is unique on our list for being created with a specific type of dog in mind. Does your dog have a white coat that regularly looks a little dirty? This is the shampoo for you! It’s formulated specifically for dogs with white coats. It whitens their coat and removes stains while staying away from dyes, harsh chemicals, or alcohol! The milk and honey formula not only lends its scent to the shampoo but gives your dog a pearlescent shine that can’t be beaten! It’s soap-free so it won’t irritate your dog’s eyes or skin. Instead, it works to gently moisturize them. It works for all dog breeds as well! This formula is the best natural dog shampoo for dogs with white coats that we found! We love that this is an all-natural formula that helps dogs with white coats stay looking their best, with no hassle on your part! Remove stains from your dog’s coat easily! 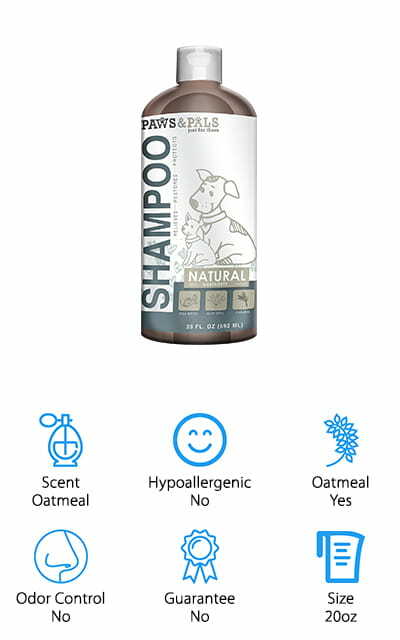 The Paws & Pals dog shampoo is made from essential oils – balanced perfectly to provide the best care for your pet’s coat. It’s a premium treatment that is vegan and organic, without sacrificing any quality or scents! It naturally smells like oatmeal as well as the essential oils that are present, making it a nice-smelling shampoo that your dog will love! The formula is tear-free, so your dog’s eyes and nose won’t get irritated from using it, which is a feature that we love! It’s all natural, and we really appreciate that it’s made organically, with completely vegan ingredients. Care for your dog’s skin and coat in a health-conscious way! It’s the best organic dog shampoo that we’ve found during our research. We’re sure that your dog will love it! The oatmeal perfectly accentuates the essential oils for a coat that is healthy and shiny! Give your favorite furry friend the very best with this natural dog shampoo!